Today: Happy Birthday to My Sister, Beccy, in Ireland! 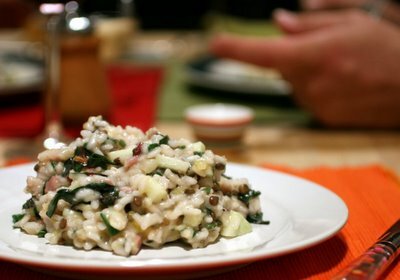 This risotto is adapted from a recipe I learnt, recently, at the wonderful Tante Marie Cooking School. I have wanted to recreate it at home ever since and Fall is the prefect time to make it. This isn't a dish where all the flavours come together, rather the opposite. Each forkful tastes slightly different which keeps it interesting. One second my mouth is exploding with sage, the next mouthful I detect the distinctive ashy-tasting bacon from The Fatted Calf. Another bite reveals the earthy flavours of the Swiss Chard leaves, followed by a piece of crunchy apple. (Apple courtesy of Elise from Simply Recipes who grows them in her garden and kindly gave me a huge bag of homegrown goodies). The recipe is fairly labour intensive. The secret is to have all of the ingredients ready and prepped before you start cooking and an open bottle of wine and glass by your side to keep you occupied through the stirring stage. 2 large cloves of garlic, minced. 1 Granny Smith Apple, peeled and diced. 1/4 cup parmesan, freshly grated. 1 tablespoon minced sage leaves. Melt a third of the butter in a large saucepan and add the garlic, shallot and bacon. Sweat together over a medium/low heat until soft and the shallot is transparent. Add the rice and mix together well, until all of the grains are coated. Pour in the wine and simmer until the liquid reduces to almost nothing. Increase the heat to Medium and make sure your pot of warm chicken stock is in easy reach, right next to your rice pan. Using a ladle, add one spoonful of stock at a time to the rice, stirring all the time. Once the liquid has been absorbed into the rice, add another spoonful and keep stirring. Continue, for about half an hour, until all of the stock has been absorbed and the rice is soft with a little bite. Immediately add the diced apple, shredded Swiss Chard, pre-cooked lentils and squash to the rice. Stir. Finish with the remaining 2 tablespoons of butter, sage and grated parmesan cheese. Add salt and pepper to taste, stir well to blend and serve straight away. PS. Experiment using different types of squash, lentils, greens and apples. And be warned - you may not like it. Fred, for example, was turning up his nose at it. Thank goodness, then, for my friend Hans who came round for dinner too. He finished off two huge helpings with gusto and annihilated my entire collection of home-baked almond macaroons. Archive Alert! I was baking cookies to raise money for Aids Charity. Oh, my... what is it they say about great minds and all that? I just posted a risotto recipe last night, too. A by-product of making stock for tomato soup, it was delicious and perfect for the chilly evening. this sounds so delicious! risotto is definitely one of my favorite comfort foods. i made a very simple risotto with roasted vine tomatoes and pesto from the Donna Hay Modern Classics Book #1. it was very good and also very easy- great for entertaining. in true donna hay fashion it was basic but the flavors were bright and fresh. definitely not as colorful as this dish. and so unique! i have never seen a risotto recipe like this before. i will try it when i am feeling very ambitious and there is someone around who will really appreciate the finished product! ...and i didn't mean that because fred didn't like it, but just someone who appreciates the effort. i am sure fred appreciated the effort!!! There is nothing like a big pot of risotto when it starts getting chilly out! I'm thinking of making one with some turkey left-overs this weekend. Yours sounds heavenly, though! Hi Sam - I never would have thought to use those apples in a risotto. What a great idea! Hi Sam, the risotto looks and sounds great, and wonderfully comforting. I had no idea you went to Tante Marie. You are full of surprises my dear! I look forward to giving the recipe a try. It was only a little one-evening-a-week for-six-weeks artisinal cooking course. Not the big 6 month one. It was so much fun though. I can't wait to go back again! fatemeh - hey doesn't it go without saying we have great minds? meg - trust you to sniff out a recipe with bacon in it! yoony - risotto is a good dish, but you have to prepared for that tranquil half hour of vigorous stirring. Kara - it is not really too complicated - you just need to have all the ingredients prepared in advance and of course being in the right season for the produce helps as well. I used the swiss chard with the pink stems which gave it a rosey hue, but could easily have gone orange to match the squash. - and the way fred turned up his nose I wasnt sure he appreciated the effort at all ;) Good job for our friend Hans! Lady A - there are those of us who don't realise turkeys need 4 days to defrost. We're the ones who wont be getting any leftovers. Oh well, good job we are going to someone else's house for thanksgiving! Elise - I have another plan for the rest of your apples. But I need to get me a nut cracker to get at those pecans! Looks and sounds absolutely gorgeous! Happy belated birthday to Beccy.